. Heaven 極楽 gokuraku and Hell 地獄 jigoku . Sanskrit : Yama or Yama-raja. 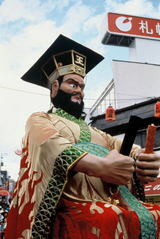 King of the Underworld; chief judge in the afterlife; when a person dies, s/he must appear before Enma (and also before other judges), who decides whether the person is good or bad; the person is then sent to the most appropriate afterworld; among the judges of hell, Enma is the most important.
. Laughing Enma at 西明寺 Saimyo-Ji, Mashiko . "If you lie, Lord Enma will pull out your tongue." A superstition often told to scare children into telling the truth. 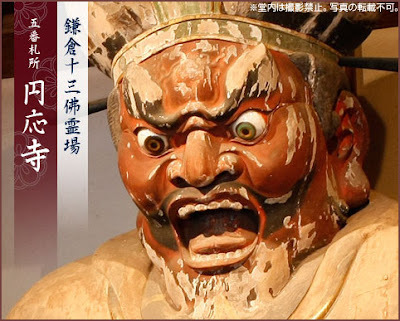 when repaying (a loan), the face of Enma. This alludes to changes in people's behaviour for selfish reasons depending on their circumstances. His regular memorial day is the 16th of each month. In January and July, Emma (Enma, Ema) is out on a holiday (Emma saijitsu 閻魔賽日（えんま さいじつ） and the lid to the chauldron of hell was closed 地獄の釜の蓋が開く日, so these two days are best to visit a temple where Emma is enshrined (Emmadoo　閻魔堂). During the Edo period, this day was also called yabu-iri 籔入り, a day when the servants and wifes of workers at shops and stores had a day off to visit their families and the local Ema temples. I used to practise Japanese Archery at the small Enma-Doo Hall in the compounds of Temple Engaku-Ji in Kita Kamakura. We had to greet King Enma before starting the pracsise and were sure he would supervise everything we did. This gave the daily practise an extra bit of severity. Click HERE for photos of Enma Halls (Enma doo 閻魔堂) !
. Juu Oo 十王, Juo, Ju-O - 10 Ten Kings of Hell . This haiku has the cut marker YA in the middle of line 2. 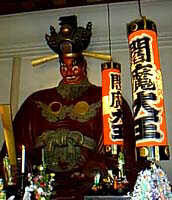 King Emma, or Yama, is a terrifying Deity in charge of Hades. Unlike "our" Devil, he is not evil. Rather than tempting men to do bad, he judges them for their sins and leads the demon brigades applying the punishment deserved. The inside of his mouth is always painted bright vermilion and his tongue curled up like it is ready to lash-out (or simply to reveal that his demonic muscularity extends even within) in fury. That was my naïve impression, but, actually, pain might be a be a better word for it, as he must himself endure a mouthful of molten copper three times a day because torturing people is bad even though he does it for the best of reasons: to discourage us from sinning and for justice. (Think about it, Christ only got crucified once. This Emma endures worse every day for our sake. Now that, Mel Gibson, is passion!) 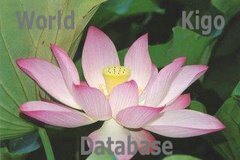 There is debate whether this famous ku is about the statue, found at many Buddhist temples, or the flower. Grammar favors the former, but I would argue that Buson suddenly imagined Emma's mouth while gazing at a red peony. That is to say, the flower is the subject though the poem does not make it so. Because Buson prefaces it with a phrase about Buddha's writhing tongue like a red lotus being spit out (Japanese religious folk-lore is full of sutra-related tongue-sightings I may relate when this is expanded into a book), I suspect symbolic significance, too, but none of the Japanese annotations I have seen ever mention any! ***** Target (mato) Including Bow, Arrow, Japanese Archery. Enma at Temple Chooden-Ji. Made in 1698. ***** . YOMI　黄泉　"the yellow springs"
Genkaku-ji was built in 1624. 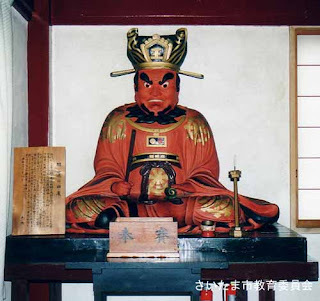 Soon afterwards a wooden statue of the god of hell, Enma-ō (閻魔王), was found in a nearby pond. It was placed in the temple and largely ignored, but then people started noticing an old woman who visited every day with an offering of konnyaku. "Why are you giving konnyaku to Enma?" was the perfectly reasonable question everybody asked. She told them that her eyes had become weak and all medicines had failed, so she asked Enma for help. One day, as she was praying before the statue, he said to her, "I will gouge out one eye and give it to you." She looked up and saw that one of his eyes was gone, and blood was running from the empty socket. When she glanced around her, she realized that she could see everything clearly. She wanted to thank Enma, but she was so poor that she had nothing to give him. She decided to stop eating her favourite food, konnyaku, and offer that to him instead. To this day you can buy konnyaku at the temple and ask the god of hell for protection against eye disease. Enma's statue was probably carved in the Kamakura period (1185–1333). and the street crossing in front of the temple is Konnyaku Enma Mae ("mae" means in front of).
. WKD : Devil's-tongue (konnyaku 蒟蒻) .
. me　眼 /　目　- Amulets for Eye Disease . Aus der indoiranischen Gottheit eines Höllenkönigs (Dharmaraaja, Emmaoo) wird er über die chinesische Variante einer taoistischen Gottheit zur esoterischen Gottheit eines Höllenfürsten bzw. Schützers der Religion (Dharmapaala, Emmaten). Auch König der Gleichheit (Byoodoooo Byodo-O) genannt. Höllenfürst Emmaten (Enma, Enra). Nummer 5 der 10 Höllenkönige. Einziger der 10 Höllenkönige, der eigenständig verehrt wird. Bei 10 Figuren ist seine die größte. Richtet am 35. Todestag über die Menschen, siehe 13 Buddhas der Totenrituale. Er ist eine Gottheit voller Mitleid und vergibt oft den bereuenden Sündern, aber am 35. Tag nach dem Tode ist meist kein intakter Körper mehr vorhanden, in den die erlöste Seele eingehen könnte. Häufig in einer eigenen Halle (Emmadoo　閻魔堂) untergebracht. Im 4. Höllenbezirk gibt es eine große Waage zum Wiegen der Sünden des Verstorbenen (goo no hakari). Eine Darstellung davon findet sich oft in der Emmadoo-Halle. Im Mandala der beiden Welten sitzt er im Süden der äußeren Abteilung. Er ist eine Inkarnation des Fudo Myo-O bzw. 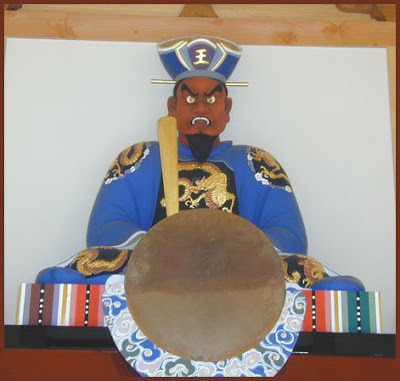 des Jizoo Bosatsu. 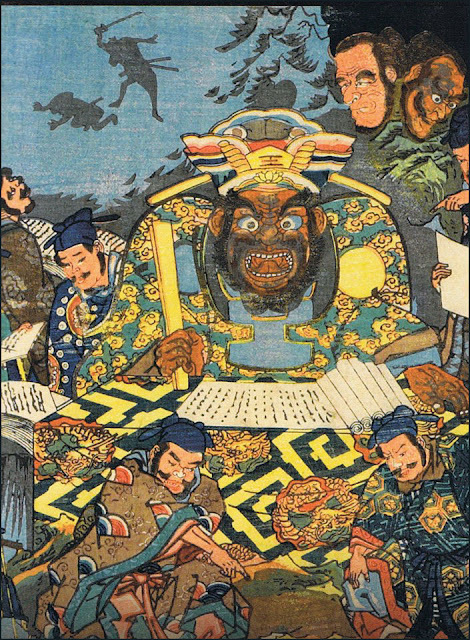 Wenn man zu Lebzeiten den Jizoo Bosatsu regelmäßig verehrt hat, wird die Seele in der Hölle von Emmaten sicher wiedererkannt und man ist einer schnelleren Beförderung ins Paradies sicher. Im Tempel Taisooji　太宗寺 in Shinjuku in Tookyoo steht vor der Emmadoo-Halle die Figur eines kinderfressenden Emma, der ein ungehorsames Kind einfach auffraß und der Gürtel seines Kimonos hängt noch aus dem Mund des Emma. Auch "Emma mit dem Gürtel aus dem Mund" (Tsukehimo Emma　つけひも閻魔)　genannt. Bis zum Beginn der Edo-Zeit wurden böse Kinder gewarnt: "Wenn Du noch einmal lügst, wird Emma Deine Zunge herausreißen!". This Enma would eat childred who did not listen to their parents and have a string of their kimono belt hang out of his mouth. His name was "Enma with a belt hanging out of his mouth". Menschliche Gestalt mit zwei Armen und furchterregendem Gesichtsausdruck. Auf der Brust einen Mond und eine Sonne bzw. das Rad der Lehre. Kleidung eines chinesischen Richters. In der rechten Hand ein Holzszepter (Zeremonialszepter) (shaku), oft mit einem oder zwei Menschenschädeln. Dabei handelt es sich um die Köpfe der Gottheiten Taizan Fukunoo und Kokuan Tennyo. Reitet manchmal auf einem Wasserbüffel. Ihm zur Seite steht oft die Schreiber-Gottheit "Gushooshin", der alle Taten der Menschen aufschreibt und registriert sowie "Datsueba" , eine furchterregende Alte, die am Grenzfluss Sanzu (sanzu no kawa) die Kleidung der Verstorbenen in Empfang nimmt. Or: "a mushroom pops up." According to the editors of Issa zenshuu, the last kanji in this interesting haiku is pronounced maire, a reading that doesn't appear in modern dictionaries. The kanji (shin), in a verb form such as susumu, means "to advance, proceed, progress" (Nagano: Shinano Mainichi Shimbunsha, 1976-79) 1.601. Michael Hebert reports that the "laughing mushroom" (warai kinoko) contains the hallucinogen psilocybin, found in many places of the world, including Europe, the United States and Japan. Issa invites the scowling Emma to eat such a mushroom, get high--and mellow out. is the subject of a number of odd stories and legends. From August 14 to 16, during the O-Bon rituals, the lid of the hell chauldron is opened and an Oni with his Kanabo throws out the dead people that got stuck under the lid. The living have to go to a temple and welcome their dead home, otherwise the dead souls will hang out at the eaves of the temple all the time. On the 16th day of the first month and on O-Bon rituals, 地獄の蓋が開く the lid of hell is opened, so people do not go to the mountain. The 16th day of the 11th and first lunar month are days of Yamanokami.